Disclaimer: We at Visions for Armidale Creeklands do not have a single vision of what our creeklands should look like. After all, "beauty is in the eye of the beholder". We invite the community to help develop some collective visions that represent what we all can agree on - help us do that by becoming involved - join us! Over many years, some sketches of possible improvements to the creeklands have been created by a number of people that we are aware of. Perhaps there are other ideas? Let us know about other concepts and sketches for the creeklands by filling out the Send us a Message form here. Many residents came together to progress their ideas for the creeklands back in 2002. One early member of our group, Ken Heenan, produced some sketches of his concepts that came out of deliberations by our working group at the time. Here are sketches of the 4 candidate areas that our group proposed at the time together with our group's aerial photo showing location of proposed water features. We acknowledge that these concepts do not come with feasibility studies, costings and the like - they are intended as possible design concepts. The left hand sketch below shows Dumaresq Creek as it appeared in 1966. The right hand sketch "... shows the creek as it would appear under the city Council's flood mitigation scheme. 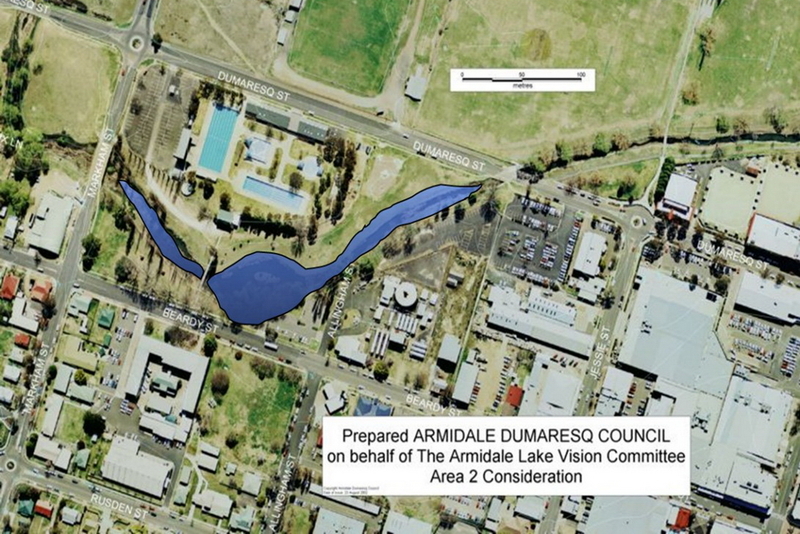 ("Like a large stormwater channel" commented a member of Armidale's Improvement and Beautification Committee)". From the caption under the images in the Armidale Express August 17, 1966.